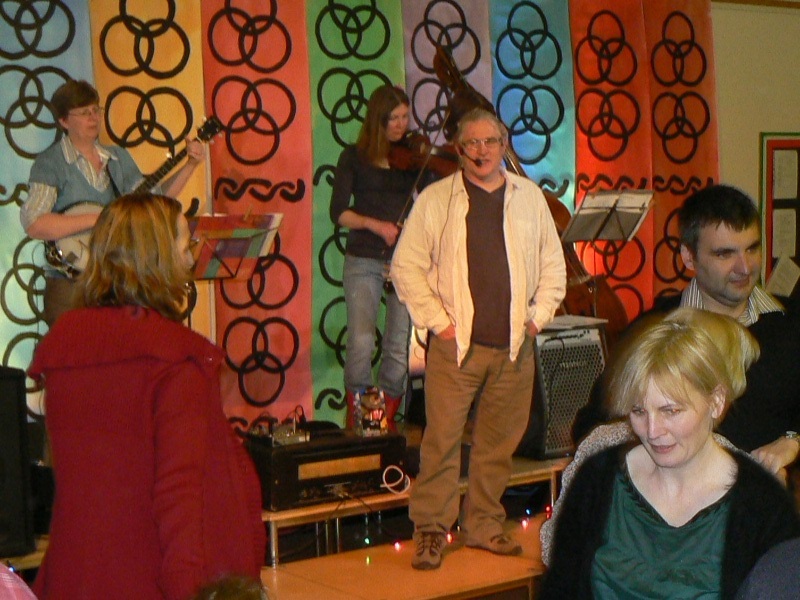 Hullabaloo is a three piece barn dance band and ceilidh band (fiddle, banjo and bass) who enjoy making music. Together with a caller we will talk you, walk you, and dance you through the dances. Don’t worry if you have never done barn dancing or been to a ceilidh before, our expert caller will soon have you do-si-doeing and promenading! Barn dances (ceilidhs or hoe-downs) are a great way of bringing people together. You greet old friends and meet new people as you move through the dances, or you can just watch and enjoy the music and atmosphere. Each barn dance and ceilidh is unique and we’d be pleased to tailor an event to your particular requirements. We can also give helpful tips on how to organise the barn dance if you wish. As a band and caller we can tailor the dances and the music to your pace and preferences. We have been together for over fifteen years and run dances for people of all ages and abilities: Scouting and Guiding jamborees, wedding receptions, big birthday parties, parent school association events, get-togethers for clubs, work socials, corporate and team building events. What do you need to host a barn dance or ceilidh? We come with our own sound system — all you need to provide is a suitable venue, refreshments, and of course the audience!